Tesco Direct is running two decent promotions this week if you need to pick up some toys. Until 28th June, you will earn 500 Clubcard points (1,200 Avios or 1,250 Virgin miles) when you spend £25 on Disney products. Alternatively, a larger order of £50 will get you 1,000 bonus Clubcard points (2,400 Avios or 2,500 Virgin miles). Details of that deal are in this Shopper Points article. For toddlers, you can also earn 1,000 Clubcard points when you spend £60 on selected Fisher-Price toys. You can learn more about that offer on Shopper Points here. Opodo has released two new promotional codes which are good for bookings made by 5th July. Full details of this ‘£1 million giveaway sale’ offer can be found on the Opodo site here. And the winner of our Dubai competition is ….. 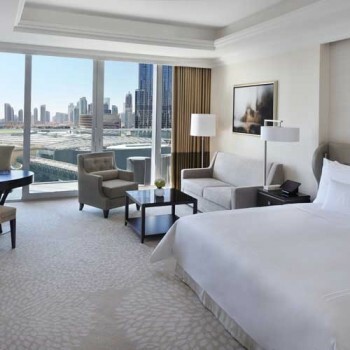 Thank you to everyone who entered our competition last week to win a three night stay at the luxurious new Address Boulevard hotel in Dubai, photo above. I was a little unsure how many people would enter, given that flights were not included and you had to travel in the next five months, but the response blew us away. The winner was Aileen B. Congratulations – Susan from Emaar will be in touch to sort out the details of your stay. We have a couple of other competitions in the pipeline, so keep an eye on Head for Points for more chances to winning decent travel prizes. Some new Amex offers this morning. As always, check Tesco you pricing carefully. Just before this offer they were selling a £25 item I was looking at for half price. It is now back to full price. As the original winner I am glad it’s going to be out to some use. You would get 500 points for booking via the app but with a four night stay it is worth risking those 500 points for a bigger return via one of the online shopping portals of your choice. I say risk because there are mixed reports on here as to the success of the various portals. Befire booking any Hilton online now I always call the hotel direct to enquure if they have any cheaper inhouse offers, if they do then you still get the points so long as they process it as a Hilton reservation. If you really want to go the extra mile you could take out a new credit card just to book the hotel. I recently did just that to collect a stash of miles on a £1000 hotel bill. Don’t forget to sign in to your account and check your offers page before booking, sometines there can be obscure niche offers you can apply. Some people have also reported receiving unique personal offers although I have never received such myself. Shopping portals are a risk. Hotel com through Avios say you will getting a lower reward if you use hotel com rewards too, but are not specific. For me the Avios usually track, but you don’t get the Avios until 90 to 120 days after the stay, and I’m finding that the posting of the Avios from the previous pending state is unreliable, and further more, the amount of Avios can change at any time. I’ve been a big fan of hotel com for some time, but find I’m looking closer at HHonours. I stayed there last October and (as a Diamond) received a fantastic upgrade from a standard sea view room to a corner suite – perfect with 2 kids. That’s promising, it will be our first visit. If you stay regularly at a Hilton, keep your eye on the Bank of Scotland or Halfax apps. There is nearly always an offer if you pay using a BoS or HfX credit or debit card. At the moment, there’s just the two offers on mine for Hilton UK & Ireland and Waldorf/Conrad Hotels but they change frequently. I’ve been using a Tab S since it first came out, never had a single problem and android upgrages regularly three years on. I like it much better than my partners ipad so if anybody is tempted and these are good offers at tesco then they could be worth going for. All samsung devices come with a two year waranty to best of my knowledge, and if any problems you can just take them into a Samsung store. My hubby has had his Samsung tablet for a few years but I love my Aye Pad! Having both in the household doesn’t do any harm as sometimes one works and the other doesn’t…the tablets I mean! OT after cancelling my HSBC credit card I’ve got 30 days to transfer out the points. Any idea if they’ll have their bonus for transfer to BA again any time soon? It is usually November when they run one. I was told last year it wouldn’t happen again after 2016 but you never know. OT – Is it possible to earn Diamond through spend on the Hilton Visa card? I have just got the card and points appearing on my account as a Bonus? Sadly not in the UK (you can in the USA) – you get Gold after £10k spend, but that’s handled by Barclaycard contacting Hilton; as you say the points themselves only post as bonus points (as opposed to IHG where they count as base points and can earn you status). No. You can earn top tier IHG status via card spend, because card spend points count for status, but this doesn’t work for Hilton. Grief, they sent me some rubbish last week then – I was also told it was £600 and not £800 …. Sorry. O/T, BA Exec Club offering 50% bonus on buying Avios, ends 30th June. So long as there’s no Avios devaluation. Quite – 4 flights to Nice for May half term next year, which coincides with the Monaco Grand Prix, are nearly £1300. Very happy to have paid 60,000 avios plus £140 fees. We’re heading to Monza this year with flights via avios and hotels paid on LeClub Accor. Hurray! Last year’s Budapest Grand Prix was similarly covered by points. If only the F1 tickets were point-based! As usual all depends on how and where used. Works for your peak date RFS uses but not my zone 7 CW which cost 150000 avios return plus about £700 taxes etc. I can buy miles-earning business class seats on AY or KL exUK for less than the cost of the avios alone under this promotion. It would not even work with a 241 because the overall cost would be ca£3000 plus the amex fee so it still exceeds the cost of two miles-earning exUK revenue flights. Not to mention one can probably feel a lot less concerned about a downgrade on those revenue flights than on a popular BA route using a 241. Did we ever find out what the compensation for the 2 4 1 downgrade turned out to be? OT- Plan to book a hilton stay for two people but have noticed the price is slightly more expensive for the same room for one person. As Hilton Gold I believe you are supposed to get the 2nd person at no additional cost. Therefore should I book the room for one person and will it cause issues if two people turn up?